-- Zhong Guan Cun 30 years ago was a quiet suburb of <?xml:namespace prefix = st1 ns = "urn:schemas-microsoft-com:office:smarttags" />Beijing with mostly green field and a few universities. 20 years ago, some small computer companies appeared on the streets outside the universities probably run by ex-students. 10 years later it grew into the largest and most vigorous IT Park in China. 77% of the companies set up here die in 3 years and many of the rest die in another two years, but nothing can stop more to come in and try to struggle though. -- In 1984, a Liu Chuanzhi started a small company called Legend, with only 25,000 US$ and 11 employers. Today it has grown into 12,000 employers and turn-over of 15 billion US$. Its name is changed to Lenovo. It now takes 35% of China's computer market and 3.8% of the world market. -- At the other end of the manufacturing power of China is the Story of Yiwu. It was a small town in one of the most densely populated province, Zhejiang. People here are known as good merchants in China. They were the first to embrace the market economy and turned Yiwu into a huge manufacturing and marketing center of consumer products, from needles to ceiling high vase. There are very few things you can't find here. Those you want and can't find they will make for you. With over 400,000 variety of commodities made and sold here at 5.4 billion US$ profit a year, things here are incredibly inexpensive. The Yiwu Index is now one of the main deciding factors on the world price for the small commodities. Take Zong Yuan for example, this factory makes pencils through 300 steps in the making and the profit for one pencil is 0.03 penny. But he makes 100,000 a day and 200 million a year. When I visited the Black Country Museum in Birmingham, I thought that this is exactly what is happening in Yiwu except for meeting the more modern human needs. Those two stories may give you a glimpse of how China has come this far. 1. As was remarked by Deng Xiaoping, China is both big and small, strong and weak. It is still very true of today's China. On the one hand, there is no economic theory that can explain the robust and lasting growth of China. This year, China's GDP is expected to catch up with Germany, reaching the 3rd in the world. According to KITA's report (Korean Trade Association) in 2006, 958 products made in China rank the 1st in the world in terms of global market shares. China is also among a few countries that are able to launch spaceship. Many who visited Shanghai have no doubt that China is a developed power. However, we in China tend to see the other side and we think China is far from strong. - China's per capita GDP is only 1/18th of Britain, ranking behind one hundred countries, along with Angola and Ukraine. 2. What does China's development mean to the Chinese people? First it means significant improvement of living standard. Per capita GDP has gone up to 2000 US$, which was 213 US$ in 1978. Far gone are the days when the biggest issue for the 1 billion people was food. -- According to the World Wealth Report 2007 issued by the Boston Consulting Group, China's wealth increased by 23.4% over past 5 years, three times more than the world average. The figure was 31.6% in 2006 alone. In the next 5 years, it is expected to grow by 17.4% while the world average is only 5.6%. There are 310,000 families that own a-million-US$ assets, the 5th in the world (only after the US, Japan, Britain and Germany). The number is expected to double in 2011. -- By the end of September, the capitalization of China's stock market reached 3.33 trillion US$, ranking the fourth in the world. The accounts opened for trading stocks reached 100 million. 30 million people are actively buying and selling in the market. According to the Financial Times, China's stock market will be 4 times larger by 2010. -- In 2006 there are 573 publishing houses turning out 13000 new books a year. There are 1938 newspapers and 9,500 varieties of magazines. Internet visitors in China amount to 100 million with 30 million bloggers. People send 32 billion text messages a month. Among the urban dwellers, for every 100 households, there are 153 mobiles phones, 47 computers and 4 cars. It also means improved democracy and human rights. -- "Protection of human rights" and "Governance on the basis of rule of law" are written into the Constitution. -- In 2005 470 million rural residents participated in village-level election. 80% villages had their own Charter of Self Administration. -- In 2006 around 2 million deputies are directly elected to the people's congresses at county- and township-level. -- By the end of 2006 there were 354,000 NGOs in China. -- There are 85,000 religious sites with over 100 million people practicing religion, mainly Buddhism, Islamism and Catholic, Protestant etc. -- China is also a party state to 22 international conventions on human rights and 24 on labors. 3. What does China's development mean to the world? It means new business opportunities and new growth. -- China's foreign trade has grown from 20 billion to 1.76 trillion US$. It is expected to import 1.2 trillion US$ worth of goods in 2010, second largest import market only after the US. 480 out of the World 500 opened business in China. McDonald opens one new restaurant every three days. -- The World Bank recorded that between 2003 and 2005, China's economic growth has contributed to the world economic growth by 13.8%, second only to the US. In 2006, China's contribution was 33% and this year is estimated at 25%, both higher than US. It also provides more things available at a lower price for the consumers from US, Europe to Africa. However, China is not without challenges. The Chinese Premier once said: With a population of 1.3 billion, any trivial problem becomes intimidating if multiplied by 1.3 billion, any benefit becomes meager if divided by 1.3 billion. Should we set the poverty standard at 1 US$ per day, 135 million people in China still live under the poverty line, about 1 out of 10. -- Regional and Urban-rural imbalance. Shanghai's per capita GDP is 10 times of Guizhou's. In Beijing average income of urban residents is twice that of its rural residents. -- Pressure on employment and social security is huge. 10 million new jobs need to be created each year just to keep pace with the growth of the new labor force. Only 12% of the population enjoys medical insurance and half of the population could not go to the hospital for treatment, mostly for economic reasons. -- Education is still a big challenge. Every year 1 million children drop out of school because of financial difficulties, 70% of which are girls. Su minjuan, a big eyed village girl dropped out of school at the age of 8. When her photo was published, her eyes touched on the heart of millions and a project called HOPE was created to help children of poor families. With help, she has now graduated from university and works in a bank. -- The cost of economic growth is high. With 5.5% of the world GDP total, China is consuming 15% of the world resources. Its per unit GDP energy cost is 3.5 times that of the US. -- Environmental problem is serious. Of the 20 most seriously polluted cities in the world, 16 are found in China. 70% of the rivers are polluted to some degree. -- Current growth patter is unsustainable. Processing trade accounts for half of China's total export. It is low in profit, high in human cost and resource consumption. A Barbie doll is sold for 9.9 US$ out of which the Chinese factory gets only 35 cents for processing. China has to export 800 million shirts in order to buy one Boeing plane. China's export is low in technology content and weak in branding competitiveness. There is a keen realization that we should upgrade the level of production. First, China will continue the road of reform and opening up. Reform is vital to the destiny of China. -- China' target for 2020 is to quadruple the per capita GDP of the year 2000 which will reach 3500 USD, (equivalent to the level of Bulgaria today.) By then China's total GDP will exceed 4.5 trillion USD, more than Japan's. To achieve the target, the 17th congress laid out a comprehensive task arrangement under the slogan of what we call Scientific Outlook on Development. It mainly means more balanced approach and sustainable growth. For example, there is emphasis on innovation and increase in the contribution of scientific and technological advancement to economic growth, promoting international cooperation in science and technology. The purpose is to increase the higher value added production. There is emphasis on technologies for conserving energy and reducing emissions, to build up the ability to respond to climate change. There is also emphasis on human centered policies and more funds with social safety development. The second message is that China will continue the path of peaceful development. -- China can only develop in a peaceful international environment. China's Foreign Trade Dependency Ratio in 2006 was 64%, higher than any other major countries. Export by foreign enterprises accounts for over 60% of the export. Foreign trade and FDI contribute 25% and 6% respectively to China economic growth. China imports 45% of its need for crude oil, 50% of iron ore, and 60% of cooper. Every year 35 million Chinese people travel abroad and receive 124 million international visitors. The interdependency is mutual and the world also benefits from China links. The Chinese President Hu Jintao used the word "Common" 13 times in the 4 pages part on foreign policy when he made the report to the 17th Party Congress. The central theme is to work with all countries in the world to maintain peace, and in return to add to peace and stability of the world by keep China stable and growing. China will be a good host of the 2008 Olympic Games. The 29th Summer Olympics will be opened in Beijing at the 8th hour pm of the 8th day of 2008. The theme is Green Olympics, High-tech Olympics and People's Olympics. 27 of the 37 stadiums and gyms are completed. Over 700,000 volunteers have signed up. We are expecting 105 000 athletes, 20,000 referees, 30,000 journalists and 250,000 staff from 203 countries. Viewers are expected to exceed 7 million person/times. It will be the largest sports event in the Olympic history. Beijing as well as the whole country is geared up for the preparations and we understand it will be a good test for China and for its relations with the world. Now, let me turn to China's relations with Britain. My past career experience is mainly Asia. I had little contact with this part of the world expect for spending a year in the University of Kent. After being appointed Ambassador to UK, I have been reading about this country and have realized that China-Britain relationship is one of the warmest of our external ties. It is characterized by, first, extensive high level contacts. Prime Minister Gordon Brown had two telephone conversations with Premier Wen Jiabao after assuming office and they both were very complementary of our relationships and committed to further the ties. In 2004, the two countries established a Comprehensive Strategic Partnership. Under this umbrella we have built extensive dialogues and cooperation. For example, we have political strategic dialogue, financial dialogue, trade and economic dialogue, sustainability dialogue, disarmament dialogue etc. We even have construction dialogue. I keep on hearing from the many visiting Chinese delegations about what they do with Britain and found our ties are both extensive and comprehensive. Secondly, we share comment interest in solving many of the international issues. In my few months here, I witnessed or was involved in some important discussions on such hot topics as Darfur, Myanmar, Iranian Nuclear issue etc. I was often told that many people here believe that no major issue in today's world could be solved without the involvement of China. It is highly complementary of China's role which we ourselves are yet to comprehend. But the British interest in coordination with China on international issues is certainly well appreciated on our side. Thirdly, there is very high enthusiasm in expanding trade and economic ties on both sides. 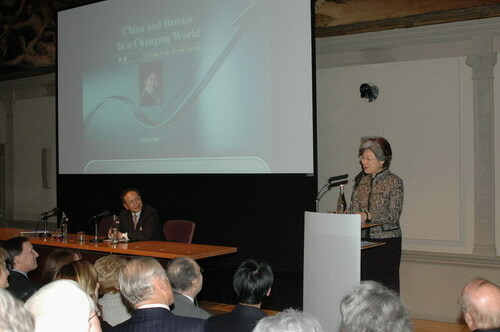 China and UK trade has been growing at a comfortable pace of 20%, standing at 30 billion US$ in 2006. The first half of this year witnessed almost 30% of increase. British investment in China stands ahead all EU countries with 5580 projects operating in China with about 27 billion US$ of investment. However, compared with the general pace of growth of China's international economic relations, Britain does not stand at very front line. You are taking only 1.5% of China's market share and we are 3.5% of UK trade. Given the size of the two economies and opportunities, there is certainly room for improvement. 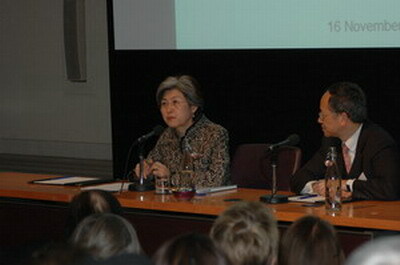 The Fourth is active cultural exchanges. Wherever I went, I could feel the growing interest among people from all walks of life to know more about China. I was told, during the Chinese New Year last February, 300,000 people attended the Trafalgar square celebrations and the London Mayor's office is expecting 500,000 for next year. I was at the opening of the First Emperor Exhibition at the British Museum and was impressed by the speech by the Prime Minister who described it as a cultural Olympic which is quite true given the public response to the exhibition. There are many other cultural activities and the traffic of both commercial and friendly cultural exchanges is quite active. 770,000 people from our two countries visited each other last year. 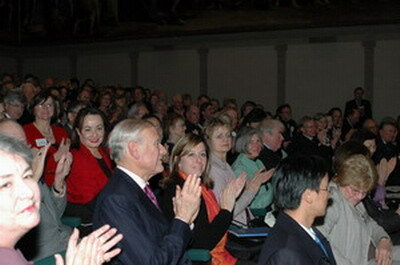 There are 90,000 Chinese students studying in Britain. The China Now program which will run through the first half of next year is a very good endeavor to unite all those cultural events into one theme that is to promote understanding between the two peoples. Understanding is one of the challenges in our relations. I found the Chinese knowledge of modern Britain is limited. There is even less comprehension of today's China among the British people outside the ring circle of China relations. As a new Ambassador, I am thinking about what contribution I can make to our bilateral relations based on the guidelines given by the leaders of the two countries and based on what has been achieved by my predecessors. The efforts should fall on the areas where the interest of both countries meets. First, to expand our service trade and to encourage more Chinese companies to invest and open business in Britain. As I mentioned earlier, China is adjusting its external economic ties to encouraging import and outward investment. Britain ranks the second in the world in terms of FDI and you have strong financial services sector. You also have a business friendly legal and social environment, as well as advantages in science and technologies, as well as design capabilities. I am confident that Britain will be able to attract more Chinese companies to come here. Yesterday I had a visitor, a Vice Minister of Construction, who is very interested in the progress of the eco-city Britain is helping to set up in Shanghai. He said if there is an interest of copying it in the Northeastern part of China, he would like to work on it. The two sides are planning to organize a major business summit during the Prime Minister's visit in Beijing which will provide a high level platform for the two business world to meet and explore opportunities. The second target is to promote people to people understanding which I believe serves as the foundation of state to state relations. Our connection on the 2008 and 2012 Olympics is a golden opportunity for the two people to interact with each other. Media is also an important partner we need to work with. I am going to host a round table for the media on the 17th party congress. The Embassy is actively involved with the China Now programs and is also directly promoting some of them, including the Chinese Medicine Exhibition, to be organized together with local practitioners, the Tea Exhibition with will come from the heart of tea plantation, as well as some Chinese young fashion designers. I have been impressed by the level of interest and appreciation of art in London and am thinking of introducing some of the native painters from the minorities of China to London Galleries. So for an Ambassador, there are lots of things to do in addition to attending the many protocol and funfair occasions of London. To conclude, I want to say that we are happy with our bilateral relations but believe that there are things we need to do to bring our relations to a higher level. So, let me use a quotation from Mao Zedong: "the future is bright and the road is tortuous."